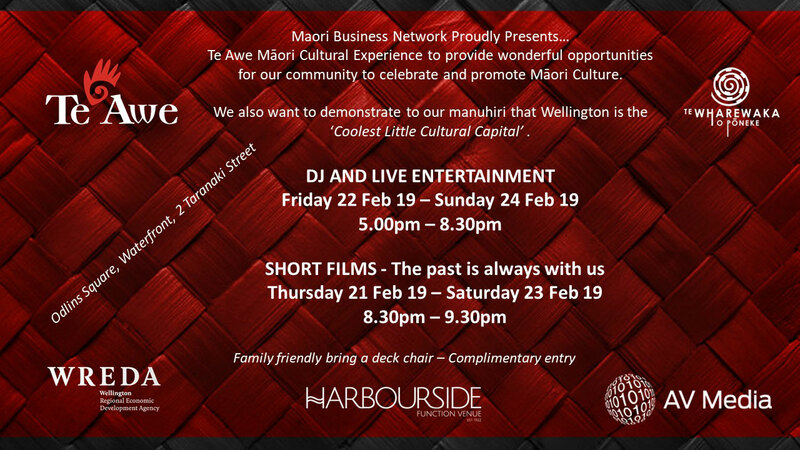 Te Awe Wellington Māori Business Network is a non-profit organisation and was established in 1996. It is the oldest Māori Business Network operating in New Zealand. We are registered with the Registrar of Companies as an Incorporated Society which is governed by a committee on a voluntary basis. Te Awe has a strong membership base representing small to medium sized businesses through to large corporate companies. Non Maori business people can also take advantage of our Associate Membership option. "Te Awe has a strong membership base representing small to medium sized businesses through to large corporate companies. Non Maori business people can also take advantage of our Associate Membership option." Te Awe's purpose is to promote, assist and encourage Māori in business through regular networking Hui where Maori business owners meet and share their business successes and challenges. Wayne was elected into the membership committee in June 2013 to grow Te Awe Sponsorship and Memberships. He has spent the greater part of his working years in the corporate world building a business success story that is second to none! His working life started on the factory floor, literally, as a cleaner in the Dunlop tyre factory. From this humble start Wayne moved to the retail part of the Company and systematically climbed his way through the company holding down a number of jobs specialising in wholesale and retail finally reaching the role of, General Manager (Sales and Marketing Beaurepaires), NZ Country Manager South Pacific Tyres and finally, Vice President Sales Australasia for Goodyear Dunlop based in Melbourne. His job was to manage over 900 Beaurepaires, Goodyear stores both company owned and Franchised. Remember the Vince Martin advertisement – this was one of Wayne’s campaigns! Retailing – Wholesaling and Exports all came under his umbrella. Wayne is a family man; father of two and grandfather of three. Since 2008 he has turned his business acumen to the running of three major whanau owned businesses. One in Construction (housing and light commercial) Chadtrista ltd and Two in Audio Visual services (AV Media NZ Limited). Wayne has now taken the role of Chairman of the Te Awe Board because he wants to give something back to the Maori world that he is a part of. In Te Awe he has found a vehicle to do just that. The Te Awe Board is very lucky to have a man of Wayne’s calibre and experience who is willing to give some of his valuable time and experience to helping others through the Te Awe business network. Paul Retimanu is a business owner (Director of Manaaki Management), hospitality guru and a father to seven children. Paul dabbled in a few career options at an early age, starting with a welding apprenticeship, through to office work. Venturing north to Christchurch, Paul joined the SPHC Hotel Chain, which was the start of his long career in the hospitality industry. Eventually transferring to Wellington, Paul worked his way from Supervisor to become Catering Manager of 40 staff at large, a five star hotel and at the raw age of 24. Venturing out on his own, Paul started his own catering business in 1998. In 2008, with 5 children now bearing his name, Paul opened a day care centre, Te Puna Reo o Ngā Kakano. 2009, bought two whangai tamariki into the whānau, a brother and sister from Te Arawa. One who remains with the Retimanu whānau still and the other returning to her mother in 2015. In 2010, Paul then set up his current business Manaaki Management Ltd, a company that provides full venue, facility, food and beverage services, a company that now manages Wharewaka function centre, Pipitea marae and function centre, Wellington rowing club along with Toitu Poneke-Hub function spaces. In addition to this Paul operates a very successful café and summer bar, Karaka café. Paul volunteers on boards, as the Chairman of the Wellington Pasifika Business Network and Deputy Chair of Te Awe Māori Business Network, Vice President of hospitality NZ, Wellington Branch and Deputy Chair of Wellington College board. These roles enable him to contribute to the growth of Māori and Pacific business both regionally and nationally. Related links you may find interesting.